Corelli employs satire at the beginning of the novel to remark on false sense of superiority of the English at the end of the 19th century. Much of this can be linked to the themes that have been discussed throughout the course such as anxiety over racial, gender, social and economic principles that added to the discussions of degeneration of Victorian traditional frameworks. Corelli comments on the issues two-fold: first through the characters within the novel and secondly through her narrative commentary that occupancies the story. In reading Ziska, it is evident that not only is Corelli critiquing the issue of monster woman but also the viewpoints of the English, their culture, their social and spiritual beliefs, and their false superiority toward “outsiders”. In a humorous way Corelli begins poking fun at the English by describing the way in which they abandon the winter weather in pursuit of milder weather. “Infected by strange maladies of the blood and nerves, to which even scientific physicians find it hard to give suitable names, they shudder at the first whiff of cold, and filling huge trunks with a thousand foolish things which have, through luxurious habit, become necessities to their pallid existences, they hastily depart to the land of Sun” (Ch. 1). Corelli then further satirizes the English gentry by continuing that they are interested in their health on Earth but are completely ignorant and oblivious to the importance of their spiritual health. The theme of spiritual rejuvenation is prevalent within the text and is accompanied by the loose morals depicted by Gervase throughout the text. The irony which Corelli exploits in the English is that although they believe themselves to be superior in the areas of race, society, and economic status to the Egyptians and “other foreigners” they are eager to partake in the native frivolities- messing together the “best” of England with the unfit foreign land. “…in Cairo they inaugurate a miniature London "season" over again, worked in the same groove of dinners, dances, drives, picnics, flirtations, and matrimonial engagements. But the Cairene season has perhaps some advantage over the London one so far as this particular set of "swagger" folk are concerned--it is less hampered by the proprieties” (Ch. 1). Although the text is a gothic novel like the others that have been covered thus far in this course, the difference in Ziska is the strong narrative voice of the author which presses the reader, in satirical terms to re-evaluate the cherished traditions and beliefs of the Victorian system and see the contradictions and falseness to the air of superiority which held British ideas and standards above all others because often times, as Corelli shows, they are vain and ridiculous. “And the English "season" whirls…over the terrible land… which remain unrevealed to the fashionable travelling lunatics of the day,--the people who "never think because it is too much trouble," people whose one idea is to journey… food, bedding and selfish personal comfort are the first considerations” (Ch. 1). In this passage, Corelli brings together the elements of the gothic with her satirical criticism of the England during fin de siècle. By deeming them lunatics due to their prejudices against the “other” and their simultaneous desire to embrace the “otherness”, the selfish nature of the travelers also mirrors the false superiority, shallowness, and fear that was prevalent within England at the time. This should have been edited down to a short story. You could read the first two chapters for the commentary on English travelers. A chapter in the middle for the gist of the plot. And the last two chapters for all the action. I literally fell asleep three times. My advice: Skim. Skim. Skim. I read this book as part of a literary criticism class on Gothic monsters. As it stands in that setting, this book has a lot to offer. The author, Marie Corelli, is a bit of an anomaly compared to the stereotype of Victorian horror writers. She was very successful, rich, and famous during her life, but then fell into obscurity after her death. The book offers easy analysis from a variety of literary schools due to its content, which not only involves the social issues of the day, but broader issues of colonization, gender studies, and cultural studies.Beyond that, it is just a good book.The characters are fascinating, each wit their own little quirks, and although the secret it is pretty easy for a modern audience to figure out, it isn't tedious. Overall, I was very happy with the book from both a pleasure and an academic standpoint. Although, it probably gets bonus points from me for the Egyptian subject matter, which has always been a matter of interest for me. Vengeance at its best. loved it. Marie Corelli was a highly popular writer of sensational novels in the Victorian era. She combined high melodrama with an attempt to reconcile Christianity with reincarnation, astral project and other spiritual aspects not generally associated with Christianity. 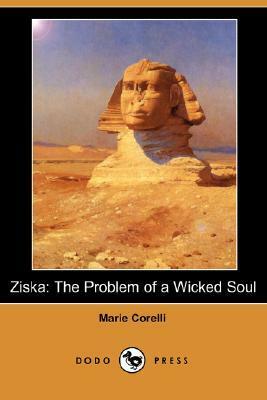 With Ziska, Corelli uses the medium of novel writing as a vehicle for just that crusade.The plot of Ziska takes place in the British society's "Season" in Cairo. According to Corelli, t is just the same as the London Season, only with slightly looser morals, giving the greater opportunity to find husbands for daughters past their prime on the marriage market. The Princess Ziska has appeared on the scene, and taken this tight community by storm. Nothing is known about her, except that she is unusually beautiful and has stolen the hearts of all the young men, the Scottish laird Denzil Murray in particular. When Murray's best friend, the famous French painter Armand Gervase, arrives in Cairo, complications arise. Gervase immediately falls for Ziska, makes no pretense that he (unlike Murray) does not have pure intentions, and feels that he knows her from somewhere.Murray's mentor and friend, Dr. Maxwell Dean acts as the mouthpiece for Corelli's unconvetional spiritual beliefs, and through him the reader begins to see that there is something not quite human and Ziska and that she and Gervase are somehow destined to be together.A good portion of this novel is given over to soliloquy in which Corelli expresses her opinion about various things. The first 21 pages, for example, are a roast of the British tourist in Egypt, and of how said tourist wants to make all foreign lands into another version of England. It made for amusing reading, but I did begin to wonder if I had stumbled onto a book of essays instead of a novel.The rest of the book is much taken up with much discussion of reincarnation and of a slightly different take on Christianity. It was interesting the first time, but Corelli has her characters discuss this time and again, and for paragraphs and pages, and by the end, I was skimming large parts of conversations. The actual storyline was rather thrilling, in the way of a Victorian sensational novel, despite the fact that Dr. Dean spells it out for the reader several times. Had it not been for his "spoilers" and for the recurring, yawn-inducing philosophizing, this would have been a rather good read. There was drama and humor and emotion, as well as interesting characters, but there was just way too much laborious, stilted conversations about spiritualism that kept interrupting the flow and made Ziska a struggle to finish. Marie Corelli (the nom de plume of Mary Mackay) writes a strangely fun and funny story about vengeance, passion, morality, and life after death. It's strange, because the story really shouldn't work, but it does.The opening rundown of the British tourists swarming through Egypt is spot-on, skewering all and exposing their vanity and ambition. Corelli doesn't pull any punches here; really, she shows no mercy to her characters throughout the whole story. If they have faults, the reader knows about them. The main idea of the story is that a famous French painter, Gervais, falls for the mysterious Princess Ziska, about whom nobody knows anything, except that she is unbelievably beautiful. Gervais lives by his passions, and fiercely disavows any religious leanings or belief in morality. He does what he wants, especially with women. The reader pretty much knows where things are going from the get-go, but it's an interesting path, and the commentary of the virtuous yet bizarre Dr. Dean helps the reader along. Evidently (I'm going on Wikipedia here, so, caution! ), Corelli's contemporaries didn't like her style--too florid, too much, too romantic and overblown. I thought it was fine, and I really liked her social commentary. It's rather a shame that this isn't better known.As a side note, the British in the story really seem to have it out for Émile Zola (whether Corelli disliked him or not, I do not know), but it's interesting that the main male character has the same name (in masculine form) of Zola's Gervaise Macquart (of L'Assommoir), who belongs to a family known for being ruled by their passions and ruined by their indulgences. I first heard of Marie Corelli a couple of days ago while reading Dancers at the End of time. The prim Victorian Christian "didn't care for her novels". So when I found a copy of Ziska in the oxfam in Crouch end I was intrigued to learn more. It said it was a supernatural tale set among the idle rich in 19th century Egypt which sounded great. I have to say I really loved this book! It was kinda like Bram Stoker but written by a woman populated with people usually found in Oscar Wilde or Evelyn Waugh. It really felt like it was set in the 20s or 30s despite being written in 1897. The book started with a witty and scathing inditement against cultural imperialism on the scale I've not seen in any other Victorian novels. The author seemed to have a couple of odd ideas, but on the whole I really enjoyed this book. The characters and circumstances were all very amusing. The supernatural element was significantly spooky and everything came down to the power of love and attraction, while mixing in some late Victorian spirituality. I am really glad to have picked up on the referrence to this book and will definitely have to read more of her supernatural novels! A pretty basic revenge story, not very original, it's the kinda of story thats been told alot so it seemed pretty familiar when i was reading it. It's pretty obvious that books like The Picture Of Dorian Gray and especially Haggard's She had an influence on this book. Despite lacking suspense (basilcy from the begining it's clear whats gunna happen) i enjoyed it quite abit. I liked the characters, the themes (reincarnation, ghosts, souls, love.....) and i don't know what it is but i really like Corelli's writing. This is my second book by her ~ the other being The Sorrows Of Satan which is one of my favorite books of all time. I find it really sad that she's basically forgotten and isn't read anymore. Her books aren't very easy to come by, and i was happy that i got a hold of this, it isn't great but i enjoyed it and hope i can get my hands on some of her other books. More like a novella, Mare Corelli was the great writer of sensation novels and Queen Victoria's favourite writer; it's talky set in Egypt,& I recommend this if you like the above & especially if you enjoy reincarnation romance. There is also a nifty surprise. So well done! This book is weird in a good way. A very enjoyable read, only that it suffers from oscillating behaviour between too much of supernatural and philosophy to sudden thuds of realism. Not necessarily bad, but somehow takes your focus away. It was not at all what I was expecting. This is supposedly an American Gothic novel, probably not a genre I would revisit as it is simply not what I am interested in. It had an interesting underlying theme of a twisted life after death, but other than that I didn't find it very enjoyable. She is always a different thinker with powerful women characters. I always get the feeling there is a secret in her words so I keep reading her. I really liked this book. I did find that I had to concentrate on the style of writing since it was written during the Victorian times. I would choose to read another book by this author. Marie Corelli - Marie Corelli (born Mary Mackay) was a best-selling British novelist of the Victorian and Edwardian eras, whose controversial works of the time often label her as an early advocate of the New Age movement.In the 1890’s Marie Corelli’s novels were eagerly devoured by millions in England, America and the colonies. Her readers ranged from Queen Victoria and Gladstone, to the poorest of shop girls. In all she wrote thirty books, the majority of which were phenomenal best sellers. Despite the fact that her novels were either ignored or belittled by the critics, at the height of her success she was the best selling and most highly paid author in England.She was the daughter of poet, journalist, author, anthologist, novelist, and songwriter Charles Mackay. Her brother was the poet Eric Mackay.